Legacy Christian’s Layne Burke (10) goes up to defend against a possible quick set by a Troy Christian player, during Thursday’s Sept. 13 girls high school volleyball match in Xenia. The Knights Maria Uszynski bumps up a return of serve during a Metro Buckeye Conference girls high school volleyball match against visiting Troy Christian, Sept. 13 in Xenia. Troy Christian’s Jalyn Forrer was one of four Eagles players to record service aces in Thursday’s Sept. 13 girls high school volleyball match win over host Legacy Christian Academy. The Eagles won 25-14, 25-15, 25-13. Legacy Christian’s Renee Fear goes up to try and block a hit by Sarah Johnson (22) of Troy Christian, in a Metro Buckeye Conference girls high school volleyball match, Sept. 13 in Xenia. 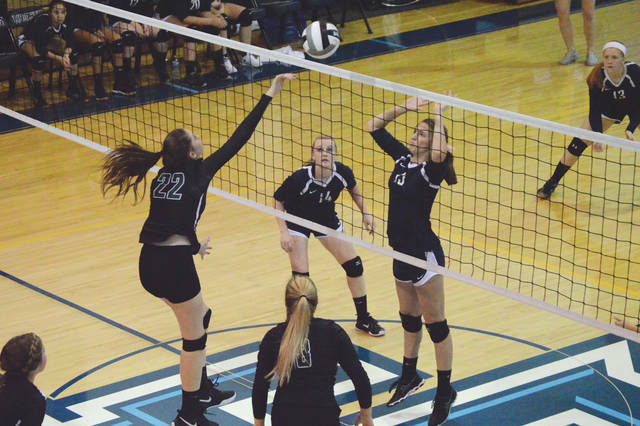 XENIA — A strong service game and a balanced attack earned visiting Troy Christian a 25-14, 25-15, 25-13 girls high school volleyball win over Legacy Christian Academy in Thursday’s Sept. 13 Metro Buckeye Conference match. 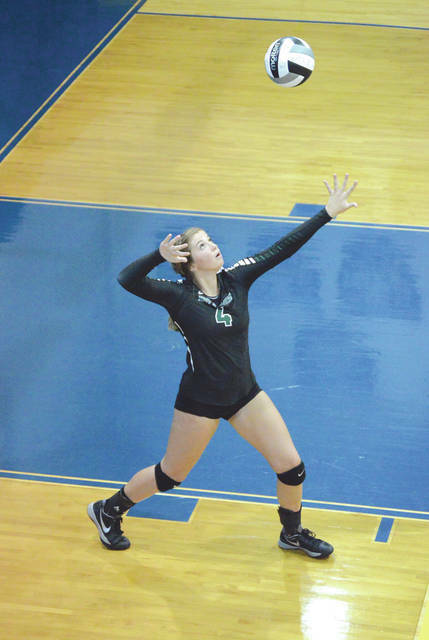 Nearly a third of the visiting Eagles’ points came directly off their serves, as the host Knights sent 22 returns of serve left and right into the stands. 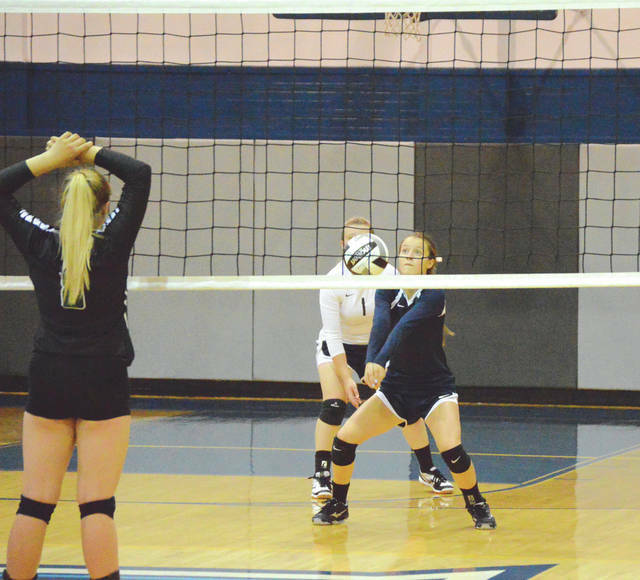 Unofficially, Lauren Montgomery and Alli Winger each bashed a pair of service aces, while Eagles teammates Emily Baker and Jalyn Forrer hit one each. Baker and Kristen Rodrigues led Troy Christian with five kills apiece, Sarah Johnson hit four kills and Montgomery hit three. Eagles coach Joshua Thomas wasn’t entirely sure what to expect from his team in Thursday night’s match. They’d lost a close match to MBC foe Emmanuel Christian on Sept. 11, and Thomas said they didn’t have a very good practice on Wednesday. Legacy Christian coach Amy Pickens wanted to talk with her team in the Knights locker room imediately after the match, and so she differed the interview duties to her husband/assistant coach Scott Pickens. 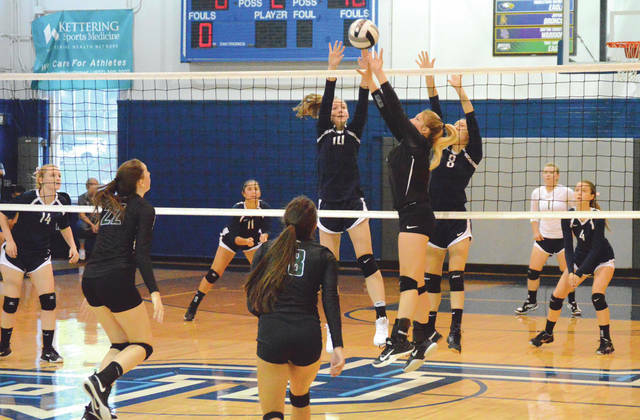 The Knights head baseball coach said that, despite a lot of talent on the volleyball team, theirinexperience was costly against Troy Christian. Renee Fear led the Knights with three kills, Layne Burke bashed two kills while Kaitlyn Crawford, Rylanne Burdette and Savannah Surls each hit one. Maria Uszynski hit a service ace and Burdette also came up with a block. LCA is now 1-7 overall this season, 1-5 in the MBC. Troy Christian climbs to 6-4 overall, 4-1 MBC. Both teams get back into action at 11 a.m. on Saturday, Sept. 15. Troy Christian will host Springfield Northwestern then, while LCA hosts Fairborn.